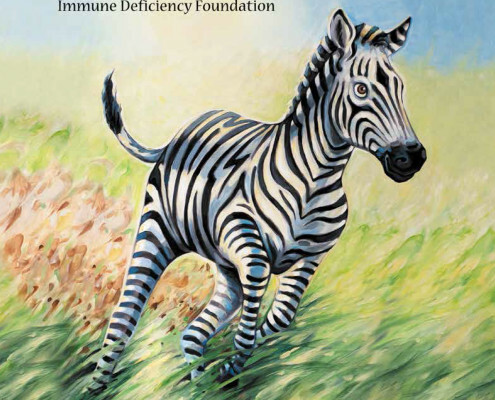 The Immune Deficiency Foundation (IDF) proudly announces the publication of A Zebra Tale from the Immune Deficiency Foundation, an illustrated storybook written for children—young and old—living with primary immunodeficiency diseases (PI) and their families to provide hope and encouragement. With a touching story created by a mother of a child with PI and beautiful illustrations, developed by a patient, this storybook was truly a labor of love. A Zebra Tale chronicles the journey of a young horse who faces recurrent infections, struggles to understand why he gets sick often, and ultimately finds contentment and acceptance when he is diagnosed with PI, discovering that he is a zebra. Individuals diagnosed with PI often identify with zebras. This is based on an old saying. In medical school, many doctors learn the saying, “when you hear hoof beats, think horses, not zebras” and are taught to focus on the likeliest possibilities when making a diagnosis, not the unusual ones. However, sometimes physicians need to look for a zebra. Patients with PI are the zebras of the medical world. So IDF says THINK ZEBRA! IDF is grateful to the American Legion Child Welfare Foundation for their support of this book and to the healthcare professionals, educators, adults and children in the IDF community for their input throughout the creation of the story. Individuals and families can download or order a hard copy of A Zebra Tale at www.primaryimmune.org/idf-publications. Hard copies can be mailed within the U.S. only.